Although free nitrogen N2 is normally considered an inert gas it is not the case when N2is exposed to elevated temperatures. Even though most N2 passes through the engine unaffected a minor portion reacts with O2 present in the air to form oxides of nitrogen. While only a small part of the N2 present in the ambient air reacts with oxygen the same happens for almost all the nitrogen present in the fuel oil, which reacts to either N2 or NO. In heavy fuel oil some organic nitrogen is present which can contribute to the formation of NOX. When organic nitrogen is present in the fuel it is expected that the majority of this nitrogen is oxidized during the combustion process. Particularly HFO can contain significant amounts of organic nitrogen and thus contribute to the formation of NOX during the combustion. Oxides of nitrogen are often referred to as NOXto express that these oxides can constitute different combinations of nitrogen and oxygen, most commonly nitric oxide, NO, or nitrogen dioxide, NO2. Other oxides of nitrogen may be present in more minor concentrations such as nitrous oxide, N2O. At ambient temperatures the free oxygen and nitrogen in the air does not react, but in the combustion chamber the temperature is high enough for a reaction to take place. 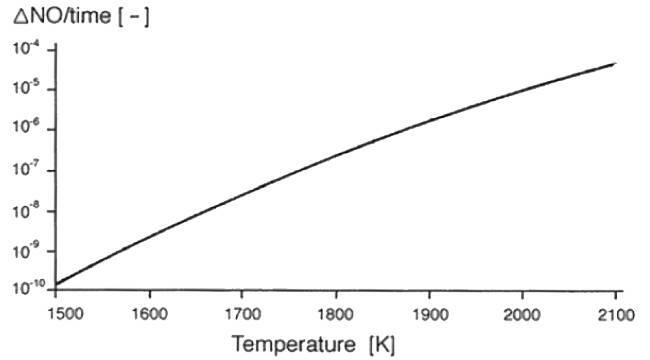 The formation of NO starts at about 1,200°C and accelerates as a function of temperature as illustrated in Figure 42. Figure 42 – NO formation as function of temperature. Because of the higher temperatures and larger excess air ratios in compression ignition diesel engines compared with spark ignited gasoline engines, NOX formation is more pronounced in diesel engines than spark ignition and gas turbines, but also parameters such as engine load, design and settings and nitrogen content in the fuel play a role. Also the humidity of the charge air plays a role since the water vapor in the air lowers the peak temperature during combustion and thus NOXproduction. When an excess of oxygen is present NO is oxidized to NO2during the time span illustrated below in table 17. Table 17 – Half life for NO. The time is takes for half the existing NO amount to be oxidized into NO2. In the exhaust stream NO will account for 90 95% of the total NOX and only in the last part of the exhaust system of after expelling of the gas from the exhaust system the formation of NO2 will take place. The oxidation of NO to NO2 in the atmosphere is partly a reversible reaction with a state of equilibrium of NO vs. NO2 depending on atmospheric factors. Nitrogen oxide, NO, is colourless and only moderately toxic. However it is, as seen in Table 17 relatively quickly oxidized into nitrogen dioxide, NO2, which is a much more harmful gas. NO2 is a toxic brownish gas, which has a stinging smell. NO2 bonds with blood hemoglobin and thus deprives to body of oxygen. NOXin concentrations about 100 ppb can cause respiratory illness (normal rural concentration is typically below about 20 ppb). Concentration of NO2 above 150 ppm is fatal to humans . NOX can react with HC and other organic materials present in the lower atmosphere in the presence of sunlight and form photochemical oxidants (ozone, O3, being the dominant). Smog is created when NOX reacts with water vapour and particulate matter in urban areas in photochemical reactions which occur when warm layers of air exposed to sunlight become trapped under cooler layers of air. This particularly happens in cities located in lower areas surrounded by more elevated areas. In the city the air is still and production of ozone takes place in the sunlight. NO and NO2 react with organic substances in photochemical reactions to produce more ozone which results in reduced visibility. The colour of the smog is often brownish and depends on the sulphur and nitrate content. Children and people with respiratory diseases such as asthma and bronchitis who are exposed to smog can experience adverse effects like damage to lung tissue, reduction in lung function and increased risk of infection. Another concern about NOX emissions is the contribution to acidic rain. Acidic rain is formed when NO2 reacts with the moisture in the air. The acidic rain harms vegetation and structures and contributes to eutrophication of lakes and e.g. the Baltic Sea. N2O is also called “laughing gas” and is used by dentists and at births. It is an anaesthetic and a strong green house gas. Considered over a 100 year period, it has 310 times more impact per unit weight than CO2. Even though N2O is only emitted in small amounts it is the 4thlargest contributor to the green house effect after CO2, H2O and CH4. Human activity is thought to account for 30% of the global N2O emissions. N2O also plays a role in the decomposition of the ozone layer since it reacts with ozone. NOX emissions can cause problems hundreds of kilometers from where they were emitted. The NOXitself can easily be carried over vast distances and when exposed to sunlight they will cause problems in the new location. Shipping is thought to contribute with 7% of global NOX emissions.